About a week ago, I launched ideacite.org. 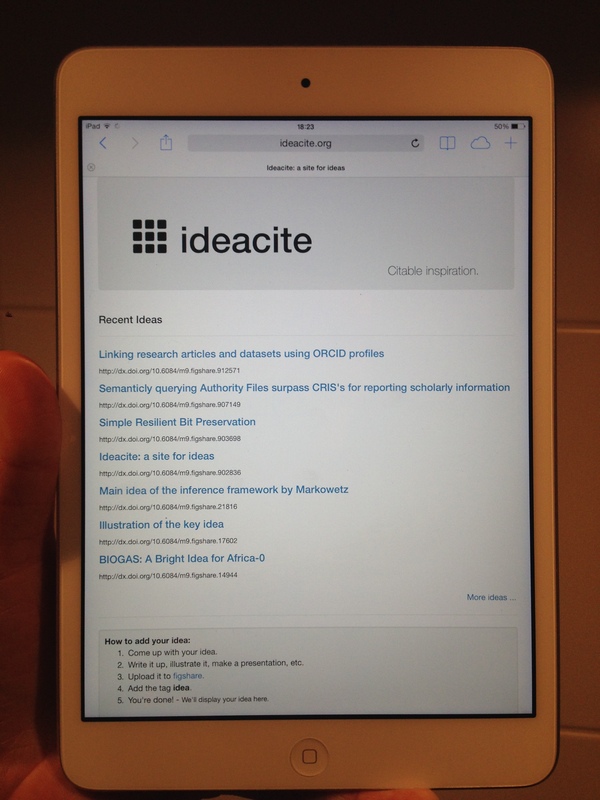 The actual idea for ideacite is on figshare. This is a side-project that I did for a couple of reasons. First, it’s always fun to build stuff so when I woke up in the morning and had this idea, I wanted to see how hard it was to just get it up running (especially given that there was a pun in the name). It was interesting to see how fast on can get to an MVP. I think it took me something like about 8 hours total to do the whole thing (a morning of so + a long friday night), and that was with thinking about which programming language to write it in . A bit about how it was built. I registered the domain name with gandi.net, which now also provides a platform as a service option for node.js. It was pretty easy to just run an instance and point the domain there. I’m actually pretty impressed with the service and it’s affordable. On the advice of Rinke Hoekstra, I ended up building the site entirely client side and just relying directly on the figshare api directly, which worked like a charm. The figshare api is nice enough not to have to do oauth for just using their search functionality and query simplifies doing all the DOM manipulation. Like everyone, I used twitter bootstrap to do the web design. The second reason was that I’m interested in enabling attributable remixing in scholarship. We can obviously cite papers (i.e. research results), data citation is becoming more common, soon will be able to cite code, so why not ideas? With this combination and some better tools, we can begin to experiment with faster ways of generating research results that build upon all the parts of the scholarly lifecycle while preserving a record of contribution. Or at least that’s the idea. Anyway, there’s lots more to do with ideacite (e.g subscribing to a twitter account which broadcasts new ideas) but I’d love to hear your thoughts on where to go next.